지리산 서쪽 기슭에 자리잡고 있는 조선시대 후기의 집으로 박연당(1753∼1830)이 세웠다고 한다. 산골짜기에 자리잡고 있으나, 주변에 넓은 들이 있어서 그리 척박하지는 않다. 집은 트인 ㅁ자형으로 경사진 곳에 사랑채와 중문채의 높이를 서로 다르게 하여 배치하였다. 솟을대문이 우뚝 선 대문채는 서쪽칸에 마루를 깔았고, 동쪽에는 방 2칸과 마루 1칸이 있다. 대문간채의 동쪽에는 연당이 있고, 북쪽에는 4칸의 행랑채가 있다. 행랑채의 북쪽, 높이 쌓은 대 위에 사랑채가 있다. 서쪽부터 4칸은 방이고 다섯째칸은 마루방이며, 둘째칸에는 아궁이가 설치되어 있다. 셋째칸에는 ‘몽심재’라는 현판이 걸려있으며, 기둥은 팔각형으로 다듬었다. 셋째와 넷째칸에서 기둥 밖으로 쪽마루를 연장시킨 것이 특이하다. 사랑채의 동쪽에는 3칸의 중문채가 있는데 가운데칸에 문이 달려있고, 문 앞에 돌층계가 설치되어 있다. 안채는 사랑채의 북쪽에 있으며 방과 대청을 중심으로 서쪽에는 2칸의 부엌이 있는데 1칸은 방이다. 방의 서쪽에는 1칸의 툇마루가 있다. 이 부분이 서쪽 날개에 해당된다. 동쪽 날개에는 2칸의 대청이 있으며, 그 옆으로 마루를 깐 방이 있고, 그 아래 방이 1칸 있다. 맨 밑에는 아궁이가 있는 아랫층과 다락처럼 구성한 2층으로 되어 있었다. 대청 앞쪽에는 문을 설치하였는데, 이것을 통해서 이 지역에도 대청 앞쪽을 폐쇄하는 유형이 분포되어 있음을 보여주는 좋은 사례가 되는 건물이다. 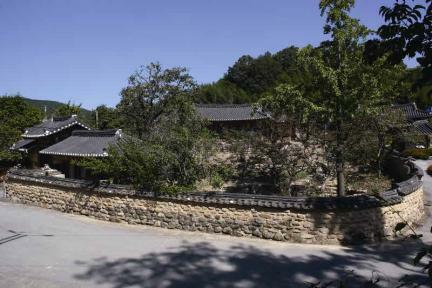 Built by Bak Yeon-dang (1753-1830) in the late Joseon Dynasty, this house is situated on the west foothill of Jirisan Mountain. Even though it is located in a valley, a large field surrounding the house softens the landscape. It is sitting on a slope, so the sarangchae (men’s quarters) and the middle gate wing are built at different heights. 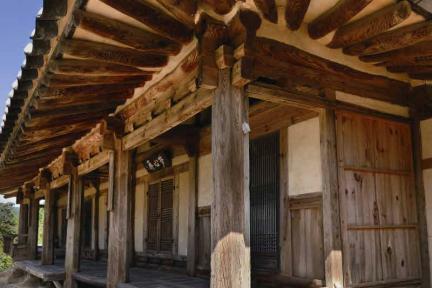 The daemunchae (main gate quarters) featuring a tall gate has a wood-floored hall on the west side and two rooms and a wood-floored room on the east side. 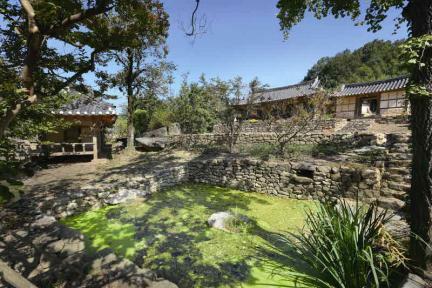 There is a pavilion with a lotus pond on the east side of the daemunchae, with haengnangchae (servants’ quarters) on the north side. 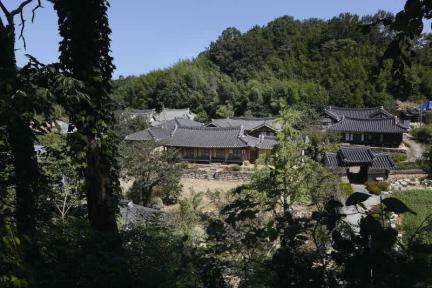 On the north side of the haengnangchae is the sarangchae built on a high foundation. 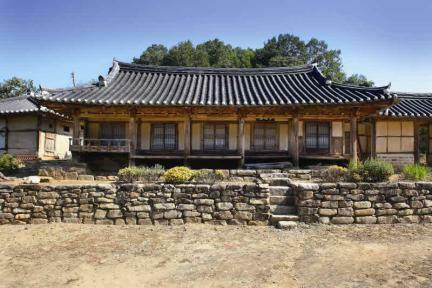 The sarangchae has 4 rooms, a wood-floored room, and a furnace arranged from the west side. It has a plaque with the writing “Mongsimjae.” Pillars are made in an octagonal shape. A narrow wooden veranda sticking out at the pillars is very unique. 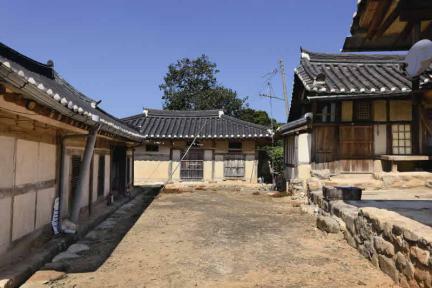 There are middle gate quarters on the east side of the sarangchae. The gate has a flight of stone steps in front. The anchae is situated on the north side of the sarangchae. 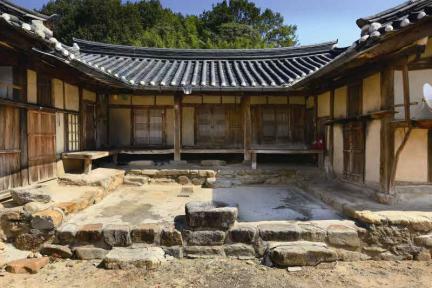 On the west side are a room and daecheong (main wooden floor) in the middle and a kitchen with a kitchen room. On the west side of the room is a wooden veranda, which makes up the west wing. There is daecheong in the east wing connected to a wood-floored room, with another room underneath. At the end of the building is a lower level with a fireplace below and an attic above. 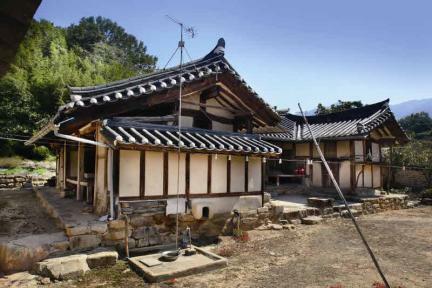 The daecheong has a door in the front, which is a good example of the prevailing architecture in this area. ※ Viewing of the cultural property above is usually available anytime but may be limited depending on the owner’s personal circumstances.